In an effort to maintain the GDP growth target of 7%, the India’s central bank Reserve Bank of India (RBI) has cut repo rate by 50 bps to 7.5%, Statutory Liquidity Ratio (SLR) by 100 bps to 24% and Cash Reseve Ratio (CRR) by 100 bps. As the global economic downturn has significant impact on the India’s economic growth, RBI is actively responding to the recent economic developments. Inter-bank Call Rate has jumped to almost 20% in the last few days despite the 21st Oct, CRR and Repo Rate cut. The liquidity is continue to drying up and Mutual Funds are now demanding more cash. To maintain the banking system’s stability, RBI going to infuse Rs. 40,000 Crore ($8.03 Billion) in two phases by cutting CRR. To maintain the balanced and sustainable economic growth, RBI also cut Repo Rate by additional 50 bps to 7.5%. This will helps the commercial banks to cut Prime Lending Rate (PLR) to lend the money to RBI’s focus area. Currently, various sectors of the Indian Economy is facing different hurdles and difficulties for raising money to fund their expansions and projects. 50 bps Cut in Repo Rate will ensure some stability in the economy and of course the Indian Economy also not insulated from the global economic downturn, from my viewpoint, the RBI’s recent move is commendable and going forward it will definitely work. 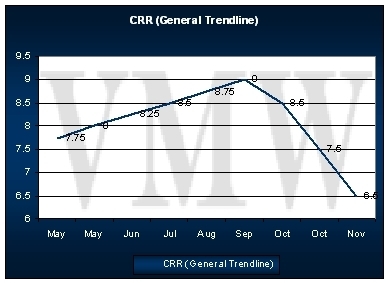 Please checkout the latest RBI Rate cut dated: 6th of Dec, 2008. Click here. This entry was posted in CRR, India's Central Bank, RBI, Repo Rate, reserve bank of india and tagged CRR, RBI, Repo Rate, reserve bank of india by THE UNIDOW POST. Bookmark the permalink.